Free Galactic Playset DLC is Here! 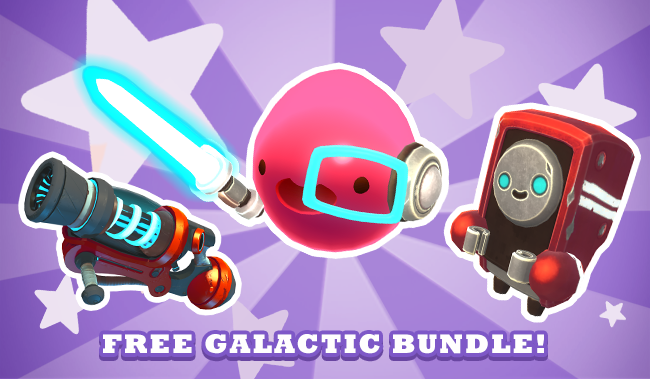 Get the new Galactic Bundle - This DLC bundle includes a Steam exclusive fashion pod, slime toy, and chroma pack! The Galactic Playset will let you dress your slime up as an intergalactic hero off to save the planet with their trusty Beeper Bot. We're also adding special, platform-exclusive Ruby Chroma Pack which you can use to give your ranch house, vacpack, and ranch tech a shiny, new paint job! We think this year is going to be a lot of fun and we’d appreciate it if you would keep any surprises you find a secret until you see the official reveal. No one wants to get a blog of tarr in their stocking, do they? Stay tuned for a full announcement later this month! You may notice a new pop-up message on the main menu of the game. This new feature is a way for us to keep you up to date on all sorts of things. For example, we will send you messages when we release a new update, if there’s big news about Slime Rancher, or when new plushies have been added to our merch catalog! Our goal with this is to keep you in the loop when there’s cool new things happening! It’s quite surprising, but apparently not everyone uses Twitter. But if you want to make sure you never miss a beat, we recommend following us on your preferred social channel (links below) and subscribing to our monthly Newsletter. - Puddles be praised! The pond received a makeover! - Gilded Gingers now appear in two locations daily and, if you listen closely, are easier to locate. Happy hunting! - Special event slimes (ie: Party Gordo) are now hidden until discovered and are no longer required in order to complete the “Pro Style” achievement. - Adjusted fruit and veggie growth to make sure they’re always ripe when entering a certain secret area. - Fixed colliders in the lab and docks that were causing drones to do gymnastics while navigating and interacting in those areas. - Fixed a bug where the shop occasionally wouldn’t add a slime key to your inventory after you purchased it. - Addressed some input issues for non-steam controllers. - Fixed a visual bug where drones appeared to be shrinking items rather than vacuuming them up. - Fixed an issue where scareslimes sometimes weren’t scary enough. Scareslimes are back to being 2 spooky 4 slimes. - Fixed a bug where Playset Slime Toys were not properly reducing the agitation of slimes dressed in the corresponding Playset Fashion Pods. - Fixed a bug that caused tarrs to stop chomping if you stood still. The best ways to deal with tarr is to blast them with water or to RUN! - Fixed a bug where the slime key count on the map did not include keys that you had already discovered. - Fixed an issue with the Newbucks UI where it could get stuck on the screen. - Minor localization fixes and improvements.